After a successful exhibition of her paintings in a London gallery in 1879, Marianne conceived the idea of presenting them to the Royal Botanic Gardens, Kew. She also generously offered to provide a suitable building in which to display them. Her architect friend James Fergusson designed a 'T'simple rectangular building with a verandah around the outside, which mirrored her feelings for India. Its design is also reminiscent of a Greek temple, in response to Fergusson's own theories and ideas on high level natural lighting in Greek temples, seen here in the form of large clerestory windows, high above the paintings. 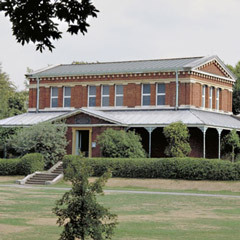 On one corner was the single storey studio for the artist's use and on another, a two-storey 'flat', intended by Marianne North as accommodation for a resident gardener. Two double-height gallery spaces allowed for the display of the oil paintings and Miss North herself took charge of the hanging over a one year period 'fitting and framing, patching and sorting my pictures' - arranging them in geographical order over a dado of 246 vertical strips of different timbers. Astonishingly, Marianne North then embarked on yet further journeys. Just two months after the opening of her Gallery, she travelled to South Africa, where many more paintings were undertaken. In 1883, she was in the Seychelles and in 1884, despite ill-health, she was painting plants in Chile. These additional works were accommodated in the Gallery by an extension that was built in 1883, bringing the total of the paintings displayed to an amazing 832 representing over 900 species of plants - a unique memorial to an equally unique woman. Today the Gallery has been beautifully restored and refurbished - allowing visitors to see the gallery in all its glory once more. Hardly any part of the building remains untouched by this: The roofs have been repaired with new slate and lead - replacing a later introduced, but deteriorating, copper roof (over the main gallery). Walls have been substantially repaired and repointed and there has been much stonework repair and some replacement where seriously decayed. Externally also the joinery and decorative metalwork have reverted back to their earlier dark colouring (having been repainted white in the late twentieth century). Internally the earlier richness of decorative detail, lost since the 1930s onwards, has been reinstated with the original stencil decoration renewed and floor tiling, to the original pattern, relaid - replacing a 1950s terrazzo floor. Of the greatest benefit to the collection is the introduction of new lighting systems (replacing fluorescent tubes) and a new mechanical air heating and ventilation system, largely making use of existing voids within the building fabric: The latter is coupled with a new hanging system for the paintings which positions them off the wall face to permit air circulation behind the frames. Now reopened and linked to the contemporary Shirley Sherwood Gallery of Botanical Art, the two galleries form a major attraction in the Gardens, each a fitting reminder of the work and generosity of two remarkable female benefactors.